El Ganzo Hotel in in San Jose is a unique venue - we love to shoot weddings there! The hotel has a contemporary Mexico City vibe and caters to musicians and artists; the rooftop pool and bar with its views of Puerto Los Cabos & the Sea of Cortez is a favorite of celebrities. The architecture is modern and minimal as is the room design - a great backdrop for photography. This Persian bride loved the venue for its variety of locations - the large suites for getting ready, the private island with beach and lighthouse for ceremony reached by 5-minute boat ride, cocktail hour at the oceanside terraces, and then a dramatic rooftop reception. This bridal photo was taken in a doorway at at the entrance of the hotel - the only place were there was a little bit of wind to catch her veil. 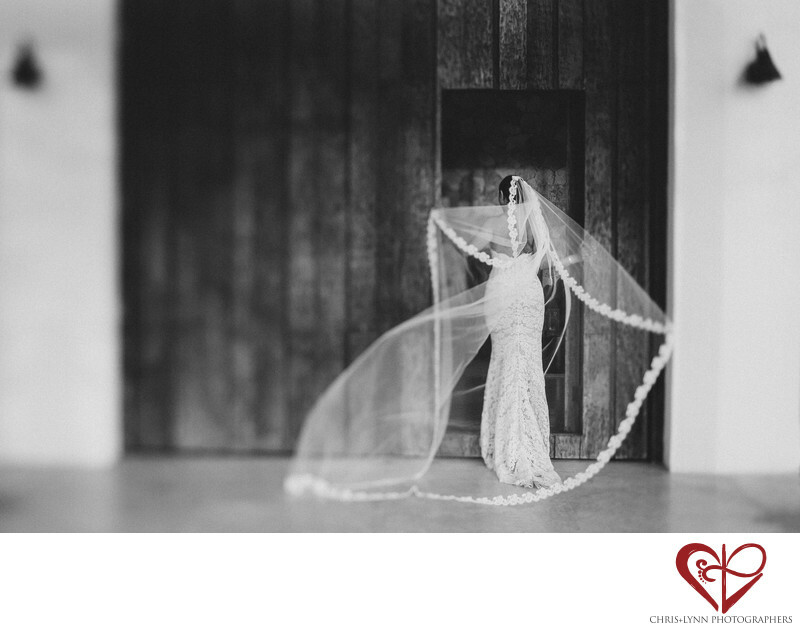 The use of a tilt-shift lens, which skews the plane of focus, accentuates the sense of motion in her veil and contributes to the dreamy feeling of this natural bridal portrait at a Los Cabos wedding. Location: Hotel El Ganzo, Blvd. Tiburón s/n, La Playita, Puerto Los Cabos, 23403 San José del Cabo, BCS, Mexico . 1/800; f/2.8; ISO 400; 45.0 mm.